I've been playing with my MISTI stamp tool along with Altenew's Vintage roses. I always had trouble lining the layers up, but this tool...wow! Pricey but wow! I was trying to figure out color combinations and had made several roses...so they were perfect to put together in a bouquet. 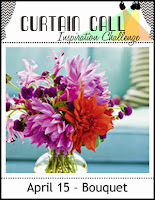 Perfect for the Curtain Call's Inspiration Challenge - Bouquet. I took my inspiration from the bunch of multi-colored flowers, the glass vase and the blue couch in the background. Of course the roses have a bit of WOS on them, but the glittery loveliness is so hard to capture in a photograph. The bowl portion of the card is thanks to Stampendous' Bowl Bouquet, and those glass marbles in the bottom, are covered in glossy accents, to provide a bit of texture. I water-colored the bowl and grounding area, the flowers were stamped with combinations of Hero Arts, Simon Says Stamp and WPlus9 dye inks. The water color panel and the card face were die cut using WPlus 9 dies. After some time visiting family in Ohio, and running a Hero Arts scramble over the weekend I have not done any card making...and it was difficult to get back to it. Nevermind that I have at least 5 cards that need to be mailed within a week! Well here is a start! I am playing in a new to me challenge - The Mixed Media Card Challenge- the theme is flowers with an option of basket...well I love flowers and I kinda like this basket weave embossing folder a LOT! (thanks for introducing me to it Michele!) So here is my take on the challenge. I started by stamping the multi step roses, then I stamped the woodgrain on a separate piece. I added some embossing paste colored with lime green glimmer mist using Simon Says Stamp leaves stencil. While that dried, I dry embossed the basket weave panel, and worked on the sentiment panel. Once my embossing paste was dry, I die cut the circle, added the fussy cut Altenew Vintage Roses and put the pieces together. The bow and pearls were added last (sticker from Jolee). I recently picked up this used PTI stamp set, and thought I would play a bit. I am always in need of birthday cards, and I thought I might send this to a blogging friend. I used Hero Arts Shadow inks, and some distress ink to color the front panel. Added sweet pink chevron ribbon from Stampin Up, and the card is complete. Thanks for stopping by! For those tough cards...Men and Boys ages 12 and up. Those cards drive me nuts... Stampin Up has a stamp set that I am going to be using quite a bit for my male card needs. I could even dress it up (pun intented) and use it on gal cards. I think male cards are so tough, because traditionally they don't get as much embellishment as the girly ones. So to combat my feelings that the card is too plain - I created backgrounds on both the card base in a tone on tone pattern, and stamped repeated happy birthdays in versamark and clear embossed them on the white panel. It's subtle texture, but it gives more interest. I am quite happy with this man card! images are great for guy cards! A bit of inking, a plain font greeting, and that's it. Okay I wet a bit further, the cat tails were colored then given just a touch of wink of stella and a bit of glossy accents for dimension. The die cut sentiments come from PTI, cut out of wood tape then inked a bit darker. The background of the main panel has some fronds from a Stampin Up set stamped very lightly in wet cement ink (Hero Arts). All is mounted on a kraft card base. Hubs and I went out to run errands last weekend, getting ready for our Easter meal. When we returned home, I check flickr and found I was about an hour late for the Hero Arts Scramble...fortunately Charlene had extended the time for the scramble, so I was able to participate. She gave us an inspiration photo -- dark woods against a beautifully colored sun setting sky. That sky portion inspired this card. I used two Hero Arts stamp sets, and some Paper Smooches star die cuts. The ribbon came from Stampin Up, and that sky was inked using distress inks. There were many pretty cards created. If you are interested you can see the thread here. On Saturday April 18th, I am hosting a 90 minute scramble at the Hero Arts Flickr group. You can check out the updates over the next few days at this link . All you need to play along is a Hero Arts Image - Die cut, stamp, stencil, digi item and some card making materials. The theme will be posted at the beginning of the scramble and then you'll have 90 minutes to make your card, photograph it and post it to the flickr thread. 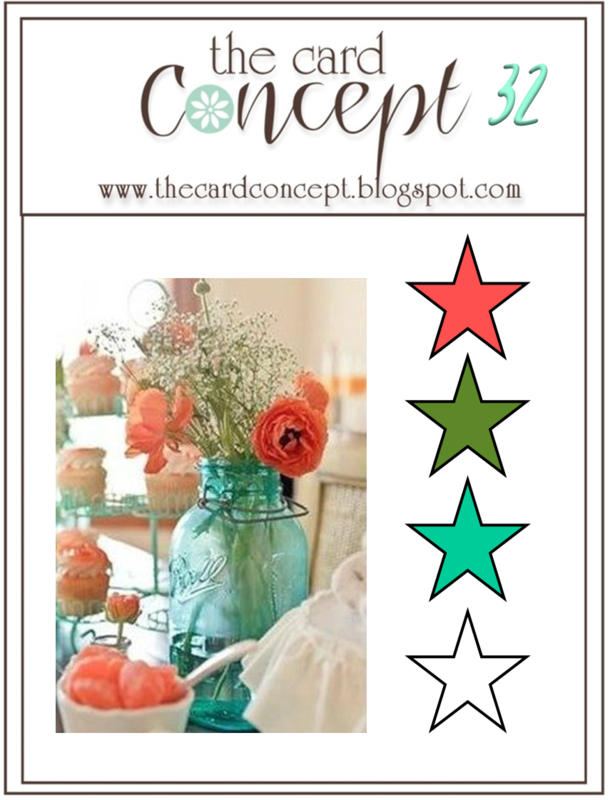 I loved the color prompt for this challenge at The Card Concept, the aqua, coral, green and white are a stunning combination. Seeing the flowers, I knew it was time to play with one of my newer Penny Black stamps Divine. Since my image is bold and the colors are all so lovely together, this card has no sentiment, and I am using it as a note card.I used one of my favorite mediums - water coloring with distress markers for this very simple clean card. This week's Muse card is by Vicki Dutcher. I tried some no line water coloring with distress markers. I used a stamp from Clearly Besotted's Fresh flowers and paired with with a sentiment from Simon Says Stamp Friendship messages, the striped panel is made with silver embossing powder and Stampendous' thin stripes. The flowers, leaves and stencil are all from Hero Arts. On Saturday April 18th, I am hosting a 90 minute scramble at the Hero Arts Flickr group. You can check out the updates over the next few days at this link . All you need to play along is a Hero Arts Image - Die cut, stamp, stencil, digi item and some card making materials. The theme will be posted at the beginning of the scramble and then you'll have 90 minutes to make your card, photograph it and post it to the flickr thread. If you do not have a flickr or yahoo account, they are free and easy to sign up for. Hope to see you there! 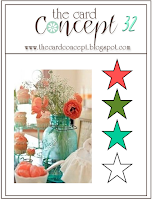 Hi there - I have an entry for the Mix it Up challenge over at Ellen Hutson's Classroom. The challenge is to use both Ellen's Essentials and Lawn Fawn products in your project. I am using Ellen's Merry and Bright die set and Lawn Fawn's Our Friendship Grows set. Thanks much for taking a look~! 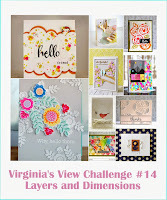 I am usually hurrying at the end of the challenge period trying to get my card made photographed and blogged. 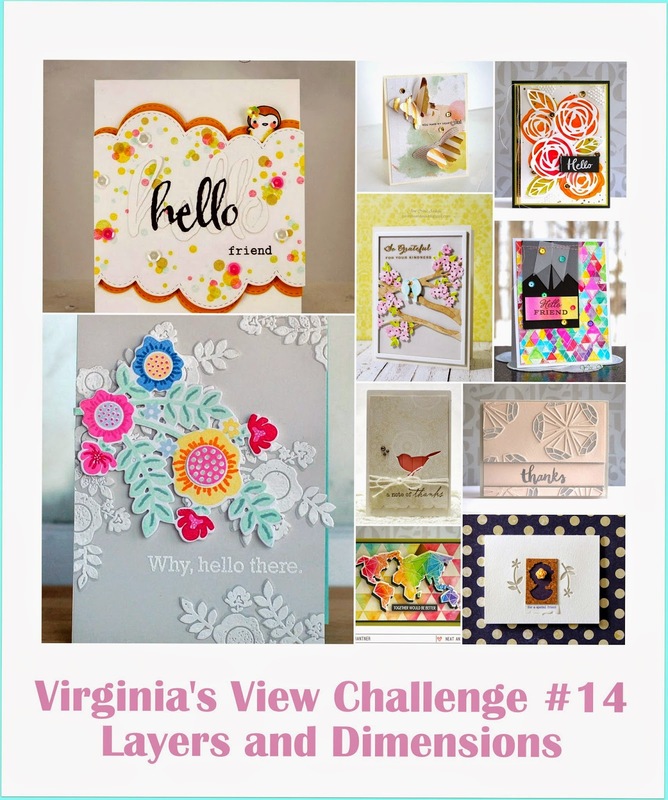 This time I decided to make my entry for Virginia's View Challenge #14 - Layers and dimension early. I love the look of vellum overlays, and that was the inspiration for my card. The color palette I used is not my usual style at all but, I ended up loving the soft blues, teals and green - for me that is a big switch...I love my colors bold! I started with clear embossing the Hero Arts Numbers background onto some water color paper. I added a layer of water colors in blue, green and teal to the card. After it dried, I swiped a damp baby wipe over the face to bring out the numbers a bit more. My next layer is vellum, since I was placing white die cut elements I needed that background to fade just a bit. I did cut the vellum layer slightly smaller than the water color panel on the sides so their full color would show a little bit. My next layers are white die cuts, Bold Blooms and Merry & Bright both Ellen's Essentials. I added three clear sequins with dots of eucalyptus stickles in the middles. Then more layers, white to frame it all and then a blue card base. Thanks so much for stopping by, and give the challenge a go - it is open until May 18th.